In February I met my reading goal by finishing The Monuments Men. This book was a very slow read even though I usually like non-fiction. The Monuments Men tells the story of a small group of artists and museum curators who were recruited into the Armed Forces to find and protect Monuments, Fine Arts, and Archives (MFAA) throughout Europe during World War II. The book is based on a true story so the author did take some liberty in overlaying more story and dialogue which did not add any additional interest to the book. I’m glad I read it because I did learn more about the start of World War II and some of Hitler’s grotesque motivations in stealing so many priceless European art treasures. Also, since my Grandpa Mago was a World War II veteran I enjoy learning about this formative time in his life. I was able to go see the movie at the beginning of March though I wasn’t really excited to spend my time on this one. The reviews I read ahead of time were not very good at all. With so many great actors I was hoping for something entertaining, despite the reviews but sadly the movie just seemed to try too hard. All of the lines were very kitschy and the focus was less on the facts of the MFAA mission during World War II than on getting a few laughs. If you’re interested in this story I suggest reading the book. There are a couple more non-fiction books on my list for this year, Unbroken and Wild, both of which look like they will be really great reads. I’m looking forward to these two towards the end of the year. 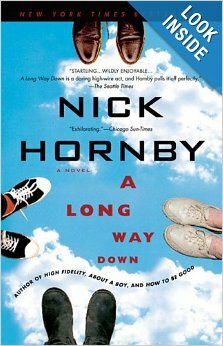 In the meantime my March book is A Long Way Down by Nick Hornby. I was able to get this one from the library. Woohoo! I’m not very far along into it yet but there has already been some laughable moments even though it is a book about suicide. The movie is being released across Europe this Friday but no US release date yet…hopefully it does well enough to come across the pond…I’d like to see this one. What books have you enjoyed so far this year?